Createk Systems cc is an Information Technology (IT) corporation focusing on Industrial Computers, Personal Computers and Servers. Createk was established in 1986 (in the days of the Intel 88 processor!) by a group of electronics engineers who wanted to make a professional difference in the personal computer industry. From small beginnings Createk has steadily grown to a multi-million Rand entity. We give you personal attention in your search for an optimum computer solution. We go out of our way to make your computer experiences as positive as possible. We provide you with the solution you require. We are Official Resellers of a wide variety of Major Computer Software Families such as Microsoft, Corel and Adobe. Createk is very experienced in sourcing Specialised Products, both on the hardware as well as software fronts. We strive to keep on top of developments in the Computer Industry. Our engineering background, current knowledge and experience, combined with our ability to find the best shipping solution for each case, enables us to get esoteric products to you in time and within your budget. On-Site and Off-Site Computer Repair Services in Gauteng. Repairs are performed by trained and experienced technicians. Service Level Agreements (SLAs) may be concluded. On-Site and Off-Site Printer Repair Services in Gauteng. Createk consists of a dedicated group of highly talented individuals, including several Electronics Engineers and Technicians. 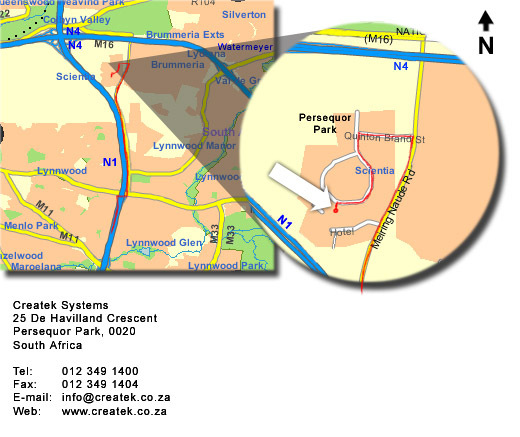 Createk has been housed in their own building in the Persequor Technopark, Pretoria, South Africa for the past 10 years. This facility includes offices, workshops and storage areas. Createk is a privately-held business entity and is registered in South Africa as a Closed Corporation (CC).